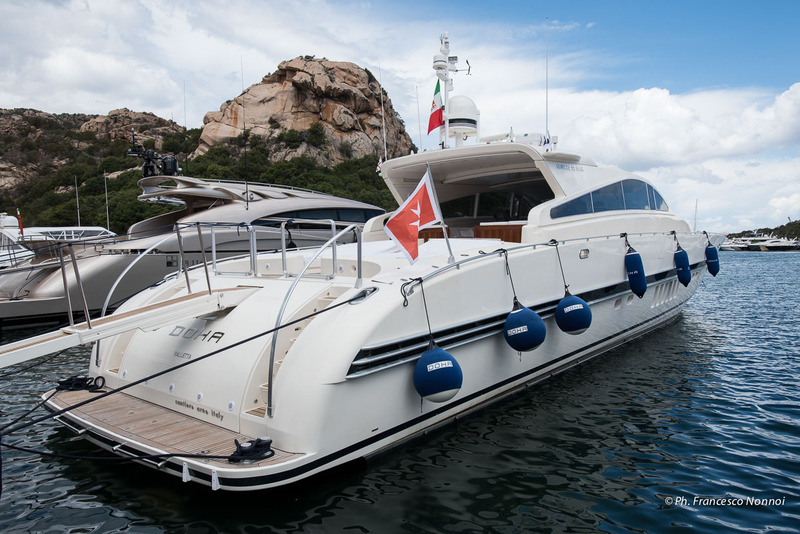 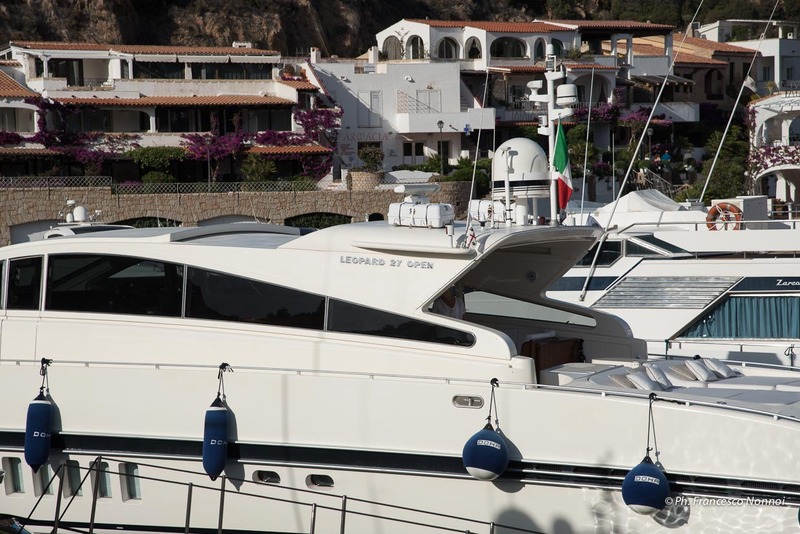 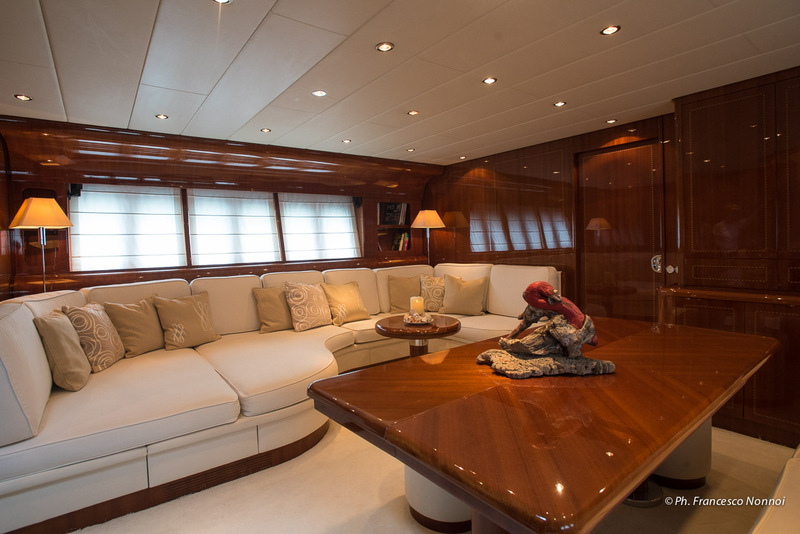 Built by the Italian shipyard Arno, DOHA is a beautiful 1999 Leopard 27 open that measures 27m (88,7ft), she was refitted in 2013 and accommodates up to 7 charter guests, in 3 cabins. 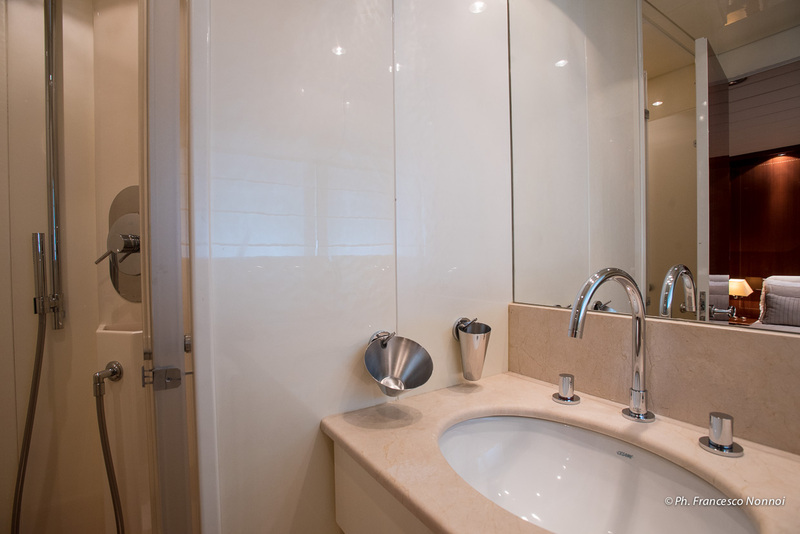 DOHA features a luxurious and stylish interior design that will exceed even the highest of expectations. 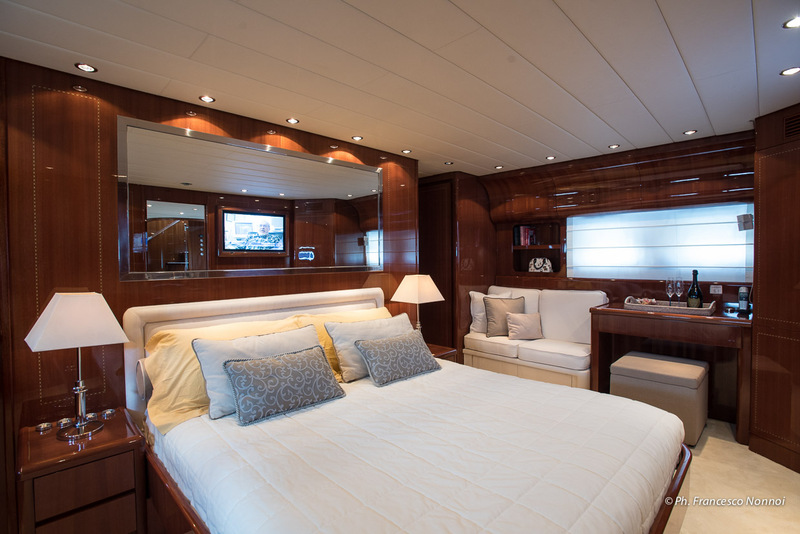 The blend of wooden paneling with white fabrics, create an elegant and comfortable atmosphere throughout. 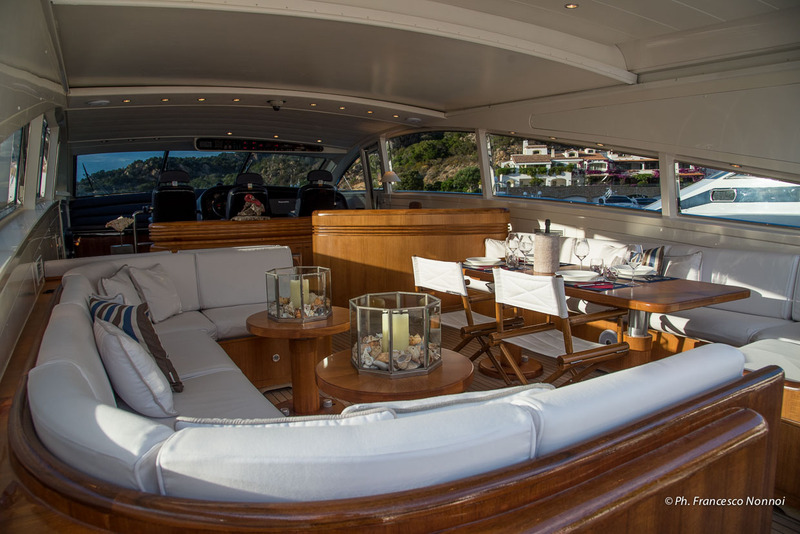 Guests will be able to relax and socialize in the salon, choosing between lounging on the large-scale sofa to port, or dining around the big dining table set between another smaller sofa and a couple of poufs to starboard. 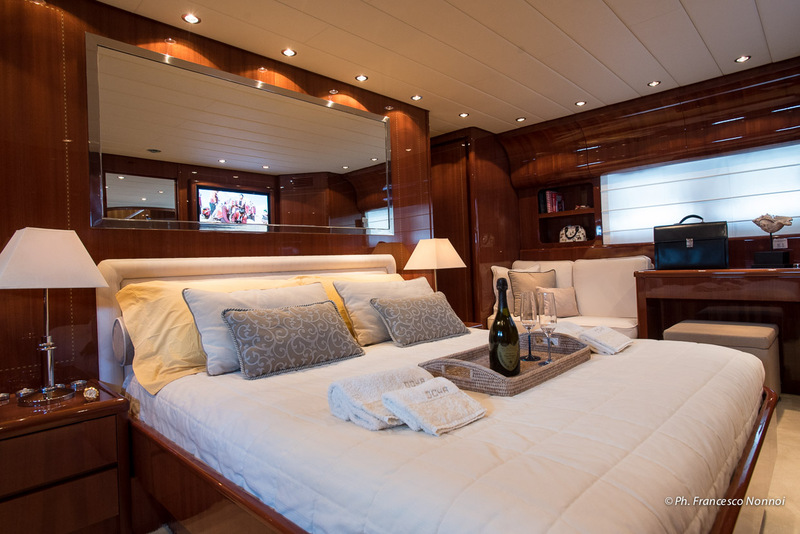 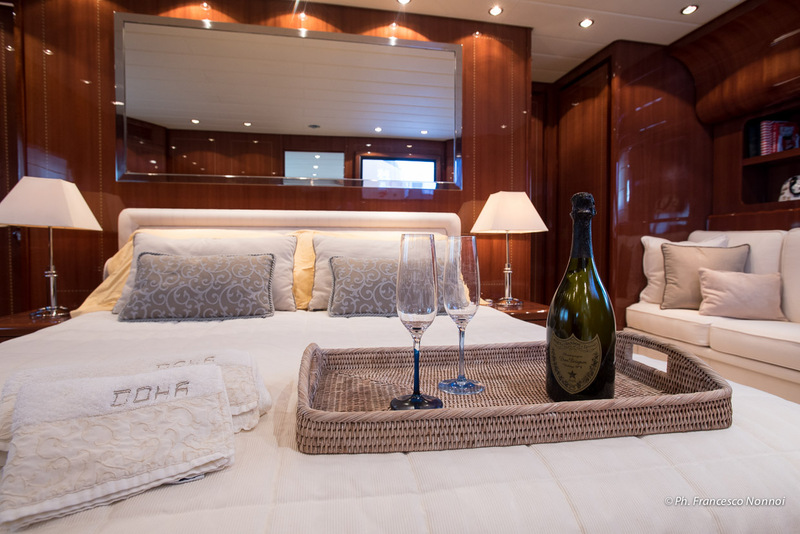 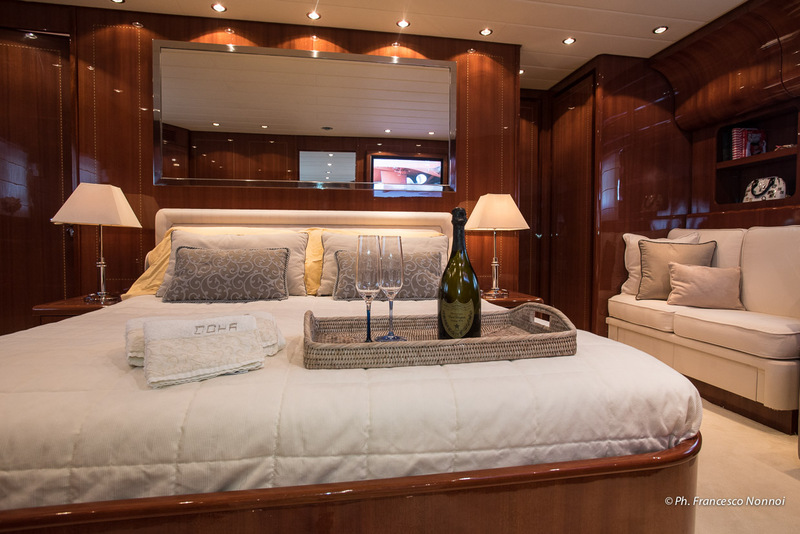 This area also leads into the 3 spacious ensuite cabins accommodating up to 7 charter guests. 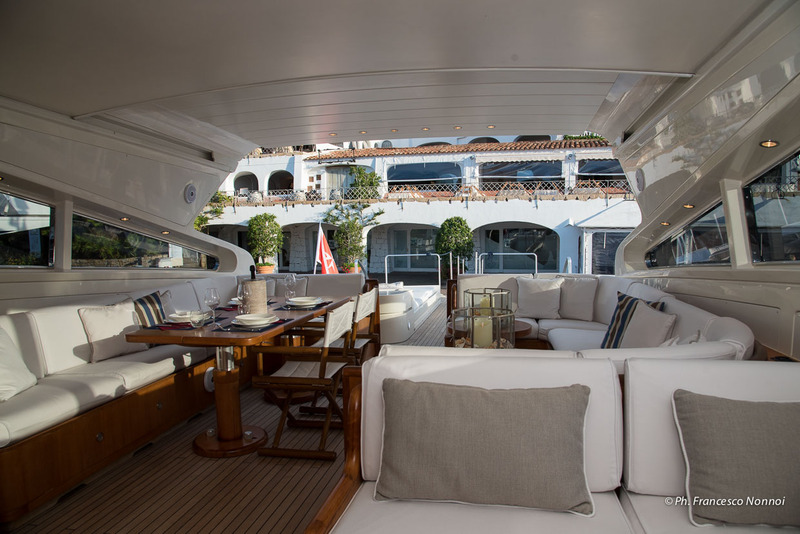 She has lots of spacious and comfortable exterior spaces for guests to entertain and relax. 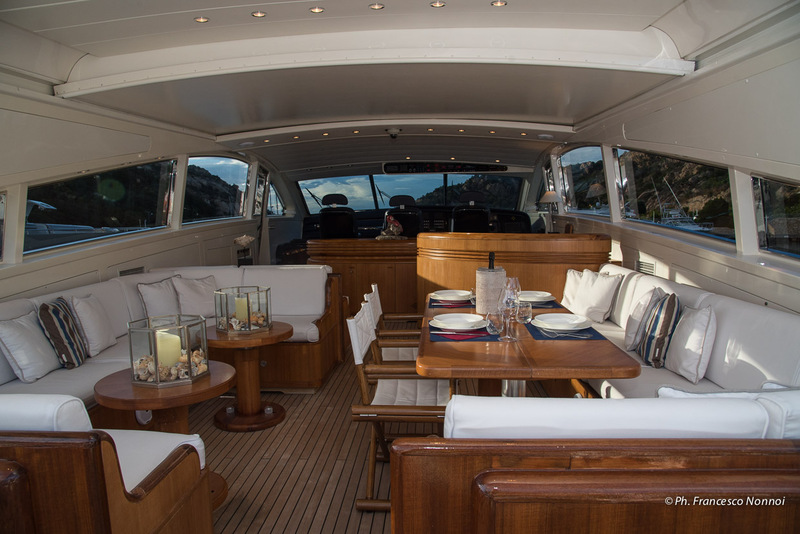 Her aft teak deck has plenty of seating all around. 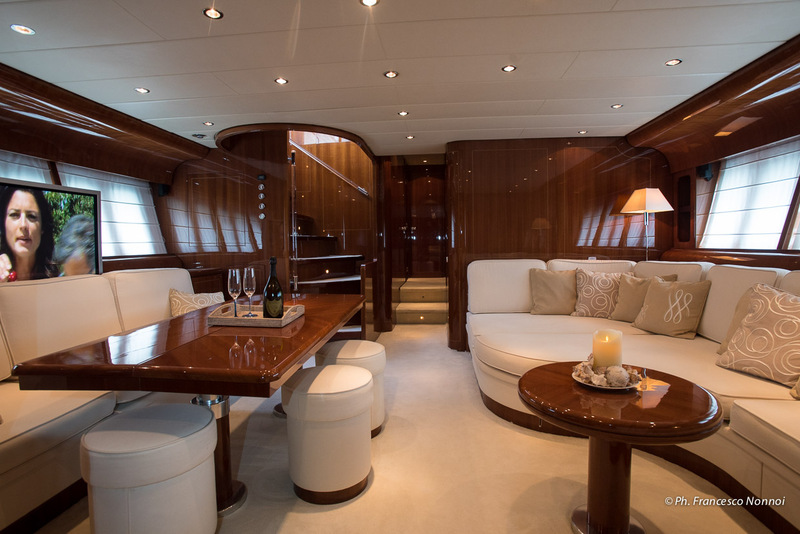 There are large sunpads on each side, followed by a vast L shaped sofa with a dining table to starboard, whilst to port side is a U shaped sofa with two round cocktail tables. 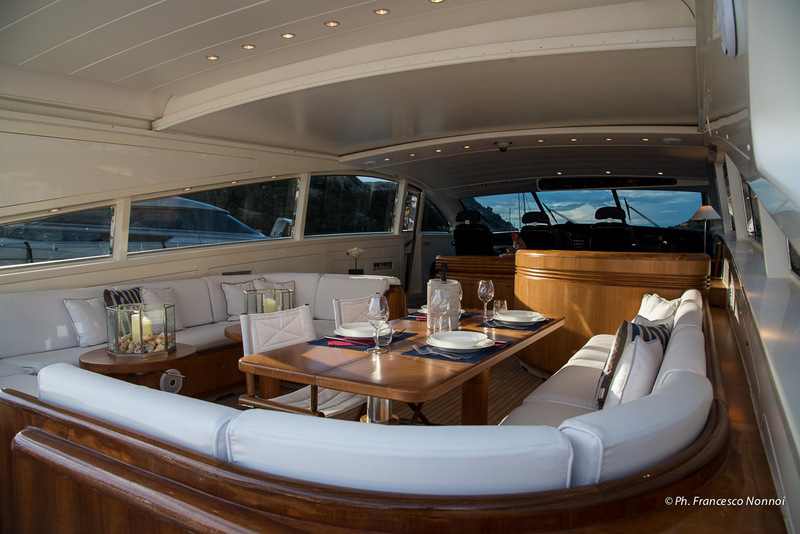 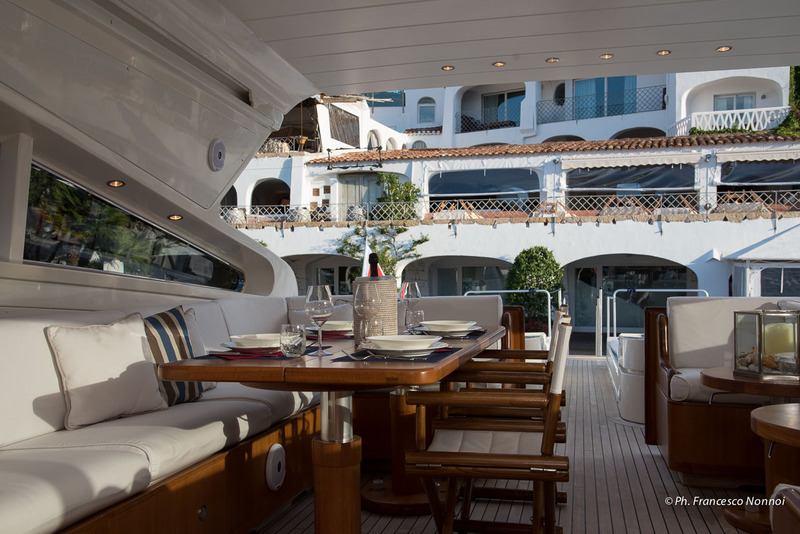 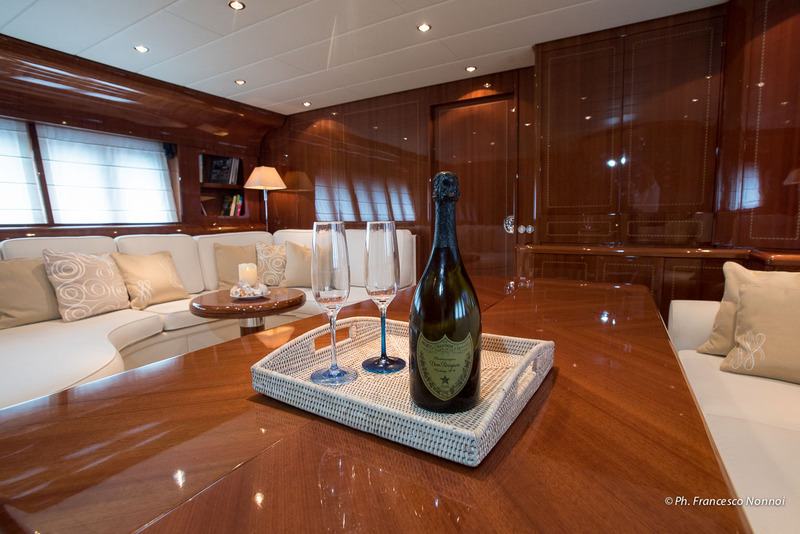 Slightly forward is a bar and a centre console where a TV conveniently pops out, followed by the helm and companionway leading into the beautiful interior spaces. 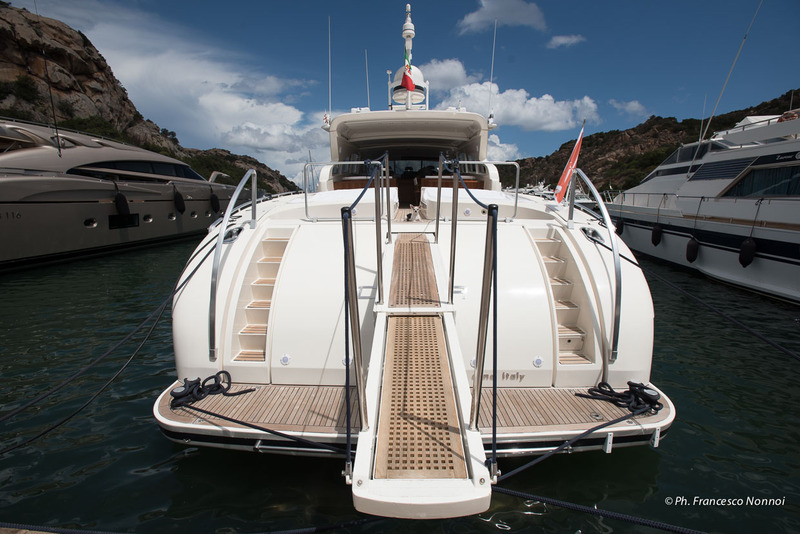 DOHA’s aft deck leads to the hydraulic passerelle and down to the swimming platform, ideal for access to the tender and to try out some of the water toys onboard. 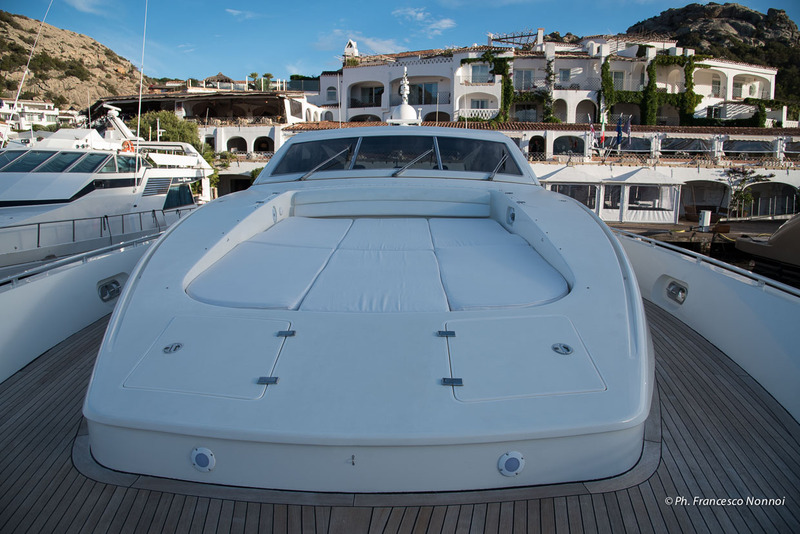 The sun aficionados will also love the foredeck, with its generous sunpads, perfect for basking by day, with a little more privacy. 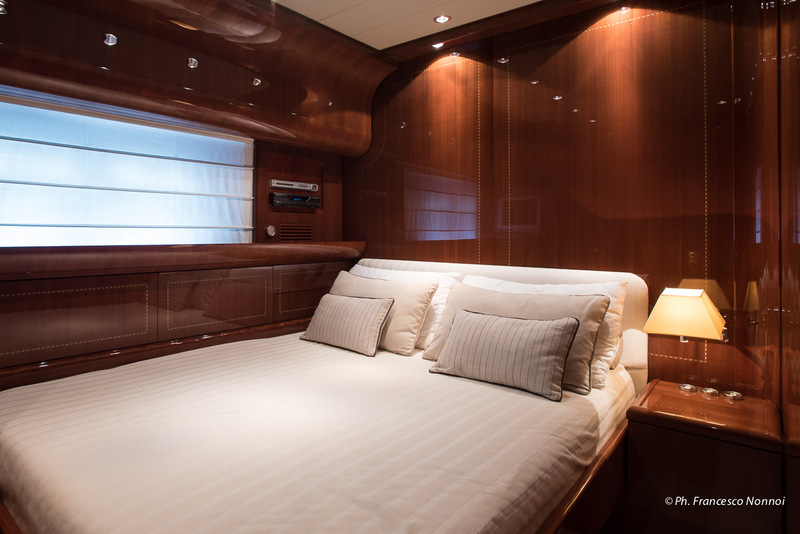 DOHA is a combination of stylistic elegance, superb performance and innovative engineering. 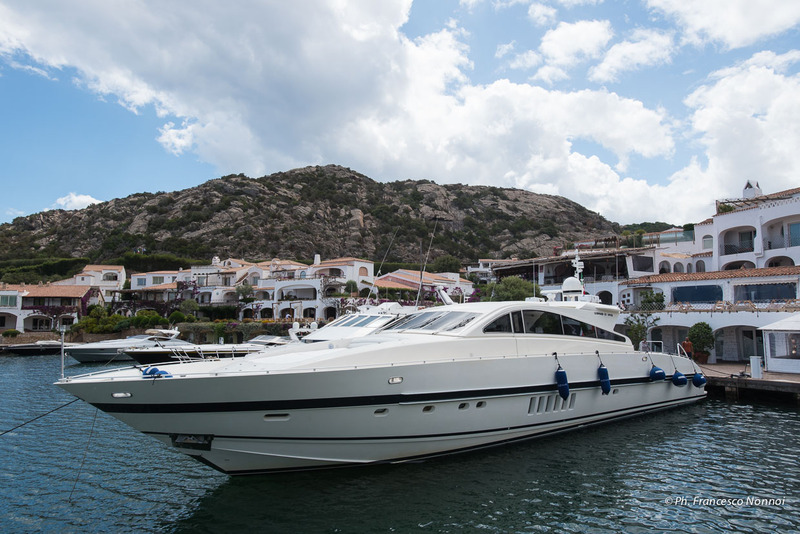 With her GRP displacement hull and 2 x MTU 1800hp engines, providing cruising speeds of 27 knots, with top speeds of 34 knots. 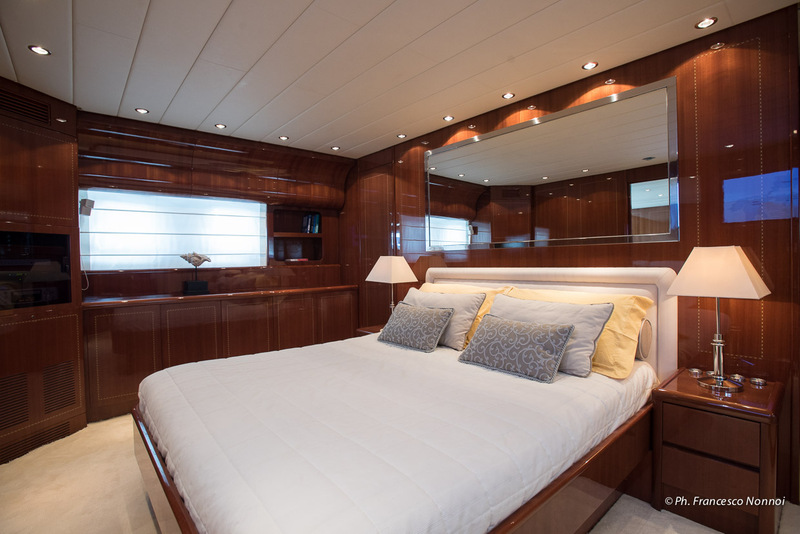 DOHA boasts three luxurious and spacious cabins. 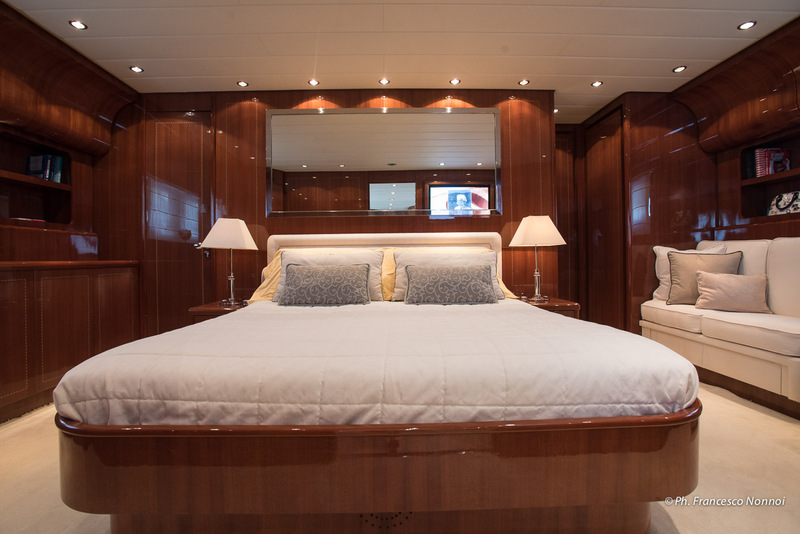 The master suite, with ensuite bathroom, is very comfortable. 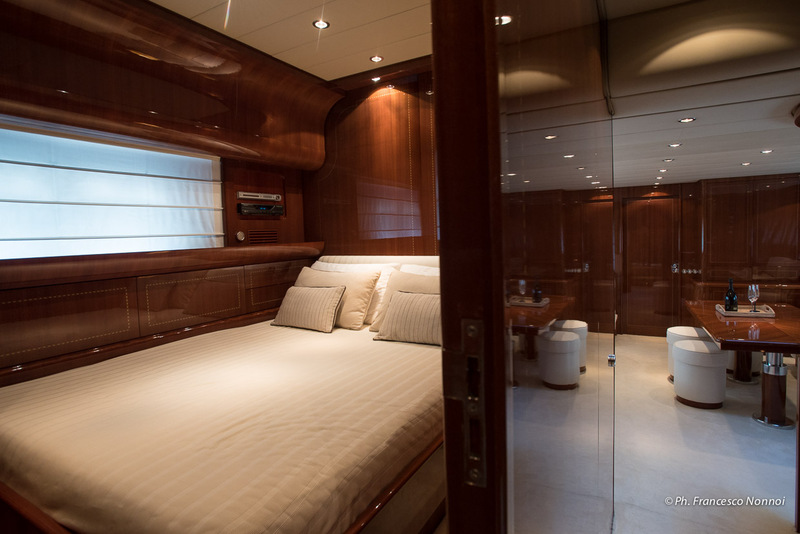 It comprises a Queen Size bed, its own office, sofa and desk. 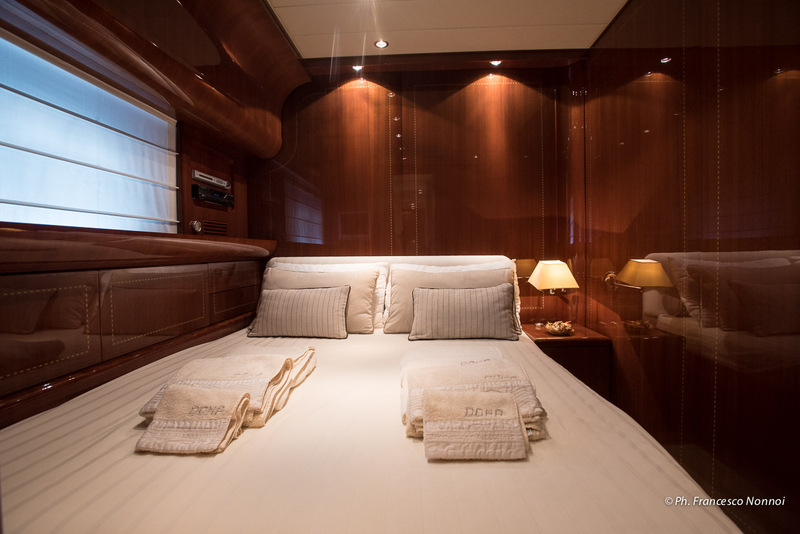 The VIP suite and twin cabin are also ensuite. 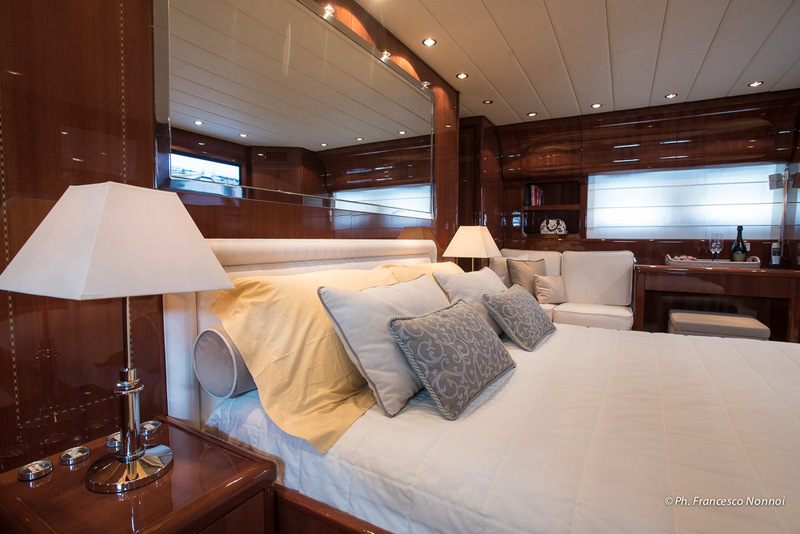 Whilst the first offers a double bed, the latter holds two singles as well as an extra pullman berth for the 7th guest. 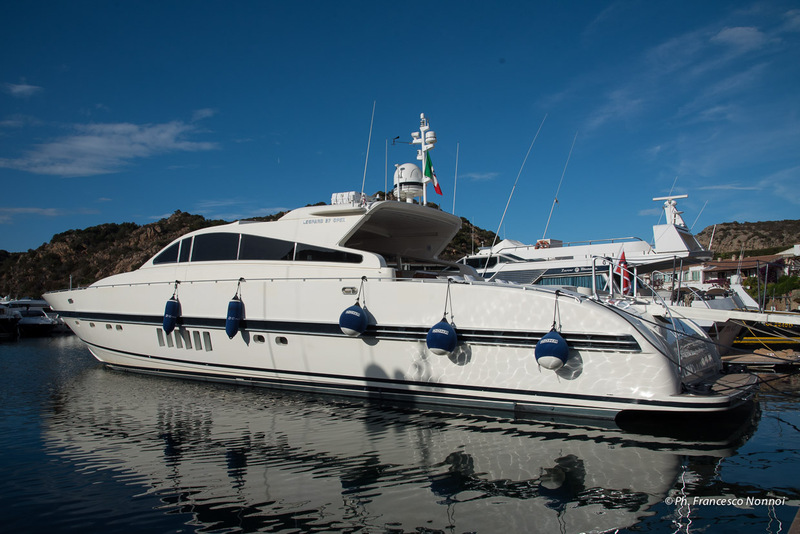 Tenders & Toys include: canoa , stand up pad , snorkeling equipments , water ski equipments, tender seawater 3,50mt fb 40c.v Audio Visual Equipment and Deck Facilities: TV SAT DECODER SAT DECODER D.T . 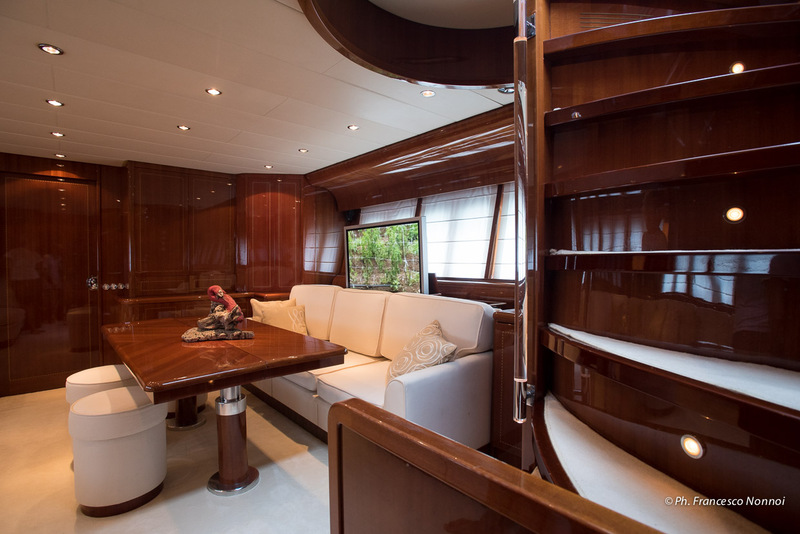 DVD STEREO dolby surround in the master cabin and external TV,WIFI,LOG, PLOTTER ,RADAR, VHF , GPS, ECO ,kitchen has all new equipments , safety box in the owner's cabin . 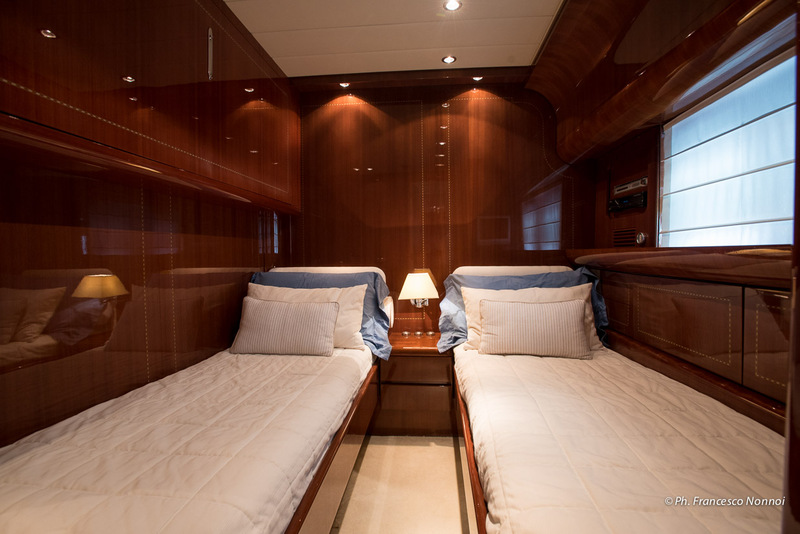 Communications: wifi, phone in each cabins ,external allarm system.